Wrapping up talks for this year, I (Gary) did a keynote talk, well, really a reading of a paper for the commemoration of violence in and around the Painesdale and Seeberville areas a couple of weeks ago. Citing some of the new research on the Seeberville shootings of striking workers Alois Tijan and Steven Putrich, and some of the new research on the Dally-Jane shootings in Painesdale, I spoke about the specter of the strike's violence 100 years later. 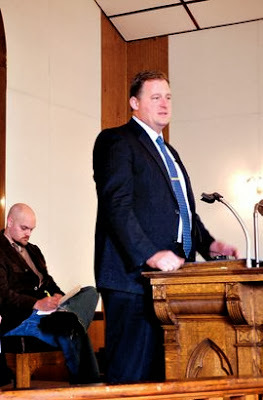 The event, a commemoration of events in the Painesdale area, was held in the Methodist Church and also featured remarks by Rep. Scott Dianda, a member of organized labor and a beacon for the labor movement in Michigan's legislature. Houghton's Daily Mining Gazette covered the event, which was well attended by about 100 people. The article from the Gazette is below along with a photo of Rep. Dianda at the podium, and me in the background taking notes on his talk. The Gazette article doesn't get all the facts right about the events at Seeberville, but does a good job summing the thoughts of the day regarding remembering the sacrifice of strikers while enduring the violence of the strike. HOUGHTON - A century after miners went on strike in the Copper Country, people met to remember the hardships and violence the miners endured during the strike. A ceremony took place Saturday morning at the Albert Paine Memorial United Methodist Church in Painesdale. The keynote speaker was Gary Kaunonen, author of "Community in Conflict: A Working-Class History of the 1913-14 Michigan Copper Mine Strike and the Italian Hall Tragedy." Upon writing the book in 2011, he uncovered previously unseen mining company documents from the era that detailed a campaign of intimidation against the striking miners. An incident in nearby Seeberville was "one of the most cold-blooded massacres" in the area's history, Kaunonen said. When one resident of a boarding house threw a bowling pin at a sheriff's deputy, he and others fired, killing two miners - Steve Putrich and Alois Tijan - who had not been involved. Putrich's infant son was grazed by a bullet. He retained the scar for the rest of his life. Houghton County Sheriff James Cruse hindered efforts to find the perpetrators, Kaunonen said; eventually, six men were arrested. The whereabouts of one suspect, Thomas Raleigh, who escaped, were said to be unknown at the time. But Kaunonen found correspondence between the Calumet & Hecla Mining Co. and a law firm representing them that placed Raleigh in New York City. He was working for Calumet & Hecla to spy on the Western Federation of Miners. In December, three people - Thomas Dally, Arthur Jane and Harry Jane - were killed at a boarding house in Painesdale. John Huhta was eventually convicted of the crime. But labor organizers said Huhta was a dupe, framed because of his ties to the labor movement. "In reality, it was not Huhta ... on trial, it was the Western Federation of Miners," he said. Ultimately, Kaunonen said, his research into the mining strike had revealed, beyond bureaucratic red tape, a "uniquely human story." State Rep. Scott Dianda, D-Calumet, felt a connection on multiple levels. His grandfather worked at the mine in Painesdale; he also has a background in labor, having been past president of Local 5 of the American Federation of State, County and Municipal Employees. He said many of today's families still have ties to the era of the mining strike. "It's a part of who we are up here," he said. Tours of the Champion No. 4 shafthouse, captain's office and house building were also available after the ceremony. Deanna Niemi of Painesdale was interested in the incidents in Seeberville, where her grandparents were from and where she lived for a year as a child. "It's important to remember them, the sacrifices," she said. "And to keep that history alive, so future generations will know what went on in those days," added Ruth Wisti of Hancock.